Essaytigers, EssayVikings, EssayOnlyForMoney... How can? Essaytigers.com is a content writing website. At a first glance, the website has an interesting design, with plenty of easily-accessible sections. Aside from being well designed, this company’s website is also very easy to navigate. Additionally, it is very active on the social media. The website offers the following services: admission essays, dissertation papers, theses, admission letters, honor thesis, professional reports, high school essays etc. There is no such thing as clear list of services on the website, at least not until you access the ordering section. The company offers decent guarantees, including on-time delivery, 100% original content, free revisions and 24/7 online support. We were able to take a look at reviews on the EssayTigers’ service. There are plenty of customers that reported bad content, spelling and grammar mistakes and content that is not suitable for their academic level. Also, there are many comments that report difficulty in receiving revisions for the work done. Apparently, the company convinces its users of the quality of the content, avoiding providing them with revisions. The blog on the website is very informative and interesting. 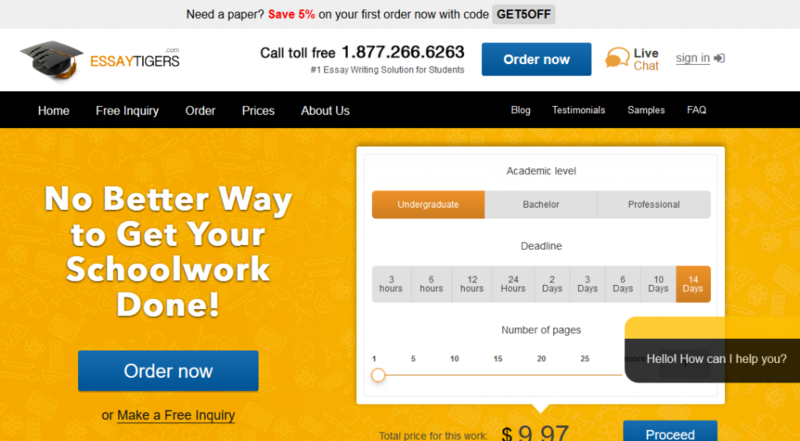 Prices on this site are affordable and start from as little as $9.97 for undergraduate level. However, we have noticed that the admission essays and other kinds of assistance come with a high price that ranges from $41to $197 per page. Prices also vary depending on the writer you choose for the order. When placing the order, you have the choice between ‘any writer’, ‘top writer’, ‘my previous writer’ and ‘advanced regular writer’. The ‘any writer’ option is free of charge, but the top and advanced writers are not. So, if you wish to order content that is guaranteed to be of highest quality, the price is no longer as affordable as it seems at first glance. Additionally, we have noticed that they are many other costs that are not included in the order. For example, an abstract page costs $14.99, sources used extra costs $4.99 (per single source) and table of content costs extra of $9.99. Even the editing part is not free; the company actually charges you if you want your paper to be proofread and edited prior to the delivery. We found this very unprofessional, especially because the company promises to provide content of highest quality to every customer. When you place your first order, you automatically get 10% bonus from the payment after the completion. Also, discounts are offered for orders above $500 (5%) and $1000 (10%). The discounts do not apply for orders below $30 and cannot be combined. Promo codes are non-existent on the website. However, you can always check the Facebook page of the company for promotions and offers.